Hello Nurse Beth, I graduated in Feb. 2016 and obtained my RN in May (first try). I have been applying since and it seems as if I am struggling to find something. I am getting rather down and frustrated. I am aware that they want experience but how can I get any experience if no one is willing to give me a chance to show that I want to work hard for them and they won't regret their decision... all my classmates have jobs now and I am still in search for a chance. I have given my resume to friends to critique, but they all say it is great but the experience area is lacking. I have gotten references from friends, wrote the nurse manager on the floor, and now I feel like I will stand in front of a hospital with a sign saying "RN will work for experience". I would love your help in any way. First of all, congratulations on passing your NCLEX, RN! Hang in there- you will land a job. It's been a relatively short time, so don't despair. You do need a plan. In today's market, it takes strategy to land a new grad nursing interview, stand out, and WOW them. Your joke about standing in front of a hospital with a sign saying "RN will work for experience" is funny (although I know you are not feeling it right now) and actually on target for "standing out from the others", but too extreme. Read "How to Land Your First Nursing Job" for helpful hints. You say that all your classmates have jobs. In thinking about it, what have you determined is the difference between you and all your classmates? This is key. You all have the same qualifications. You say they have landed jobs while you have not. Did you wait to apply until you passed the NCLEX? For readers out there, start applying in your last semester. Waiting until you pass your NCLEX can put you months behind your classmates and competitors. Many new grad programs accept applicants into the program contingent upon obtaining their nursing license prior to the start of the residency program, or close to it. References from friends do not carry weight. You need a reference from a Clinical Instructor who supervised you. References from clinical instructors carry a lot of weight for several reasons. They observed you during your clinical rotations when you were under stress to perform. Clinical instructors often have strong ties to the local hospitals, and many even work in hospitals. Their recommendation is invaluable. Again, a note to nursing students who may be reading this- obtain these all-important references while you are still in school. At the end of a clinical rotation, ask your instructor for a letter of reference. They should be on school letterhead (but they know this). If you are not landing interviews, then your resume may be the culprit. The fact that your friends say your resume is "great" - again, does not carry weight. Read "Revamp Your Resume" and make sure your resume is succinct, tailored to each employer, and contains pertinent keywords. Your resume must be error-free and visually appealing. Avoid lengthy descriptions of your clinical rotations- they do not add value. It's a given that you "administered medications" and "inserted Foleys"- but these do not set you apart from other candidates. Many employers ask new nurses applying to a new grad residency program to submit an application letter along with their application. They may ask the applicants to answer one of a few choices of questions in a short essay. Examples of these type of questions may include "Why did you become a nurse?" "Why do you want to work here (at St. John's, or Adventist Health, etc.)?" Often times a point system is employed to rank new grad applicants. For example, applicants can score 1-9 points. Take special care with your letter, as it is worth points in the application process. "Tell Us About Yourself"....because you will be asked. You must have two or three story form examples you plan to use that illustrate your skills. Here's an example of what nurse interviewers really think . Try to think like an employer. Employers are looking for employees who fit in. Nurse managers are protective of the culture and work ethic they have promoted. During an interview, if you can show that you fit into the culture and are eager to learn, you stand a good chance. Good luck, and keep your spirits up. tacticool has 2 years experience and works as a Registered Nurse. Ok, everyone but you got hired. How many hospitals, LTCs, etc., took your colleagues? What's the job market in your area? Saturated? Did you apply to any New Grad programs? If the market is saturated, look elsewhere. If you aren't willing to move, you are severely limited. Apply, or reapply to New Grad programs when the dates are available. OrganizedChaos has 10 years experience as a LVN and works as a LVN. I agree. Did the OP apply everywhere? My ex-best friend only applied to hospitals so it took her forever to land a job because she was limiting her options severely. RobtheORNurse has 30+ years experience and works as a Clinical Programs Manager. MelodyNelson has 2 years experience. What does your social media look like? I have friends that had trouble finding a job after nursing school because their facebook was full of drunk selfies. Do you look professional when you drop off your application or attend an interview? I got my first LVN job, hired on the spot 2 days after getting my license. Later I asked the DON why she hired me, and she said: "You came in in a suit, with your hair sleek into a bun. I had applicants come to drop off applications wearing low cut tank tops and fuzzy pajamas". Also sometimes you may need to work somewhere outside your chosen field, I know everyone wants Mom Baby or icu but maybe you could apply at a LTC believe me you will get a variety of experience in all aspects of nursing including team building just a though also maybe travel nursing or a job out of your immediate area, contact your instructers they usually have a lot of contacts. Good luck and hang in there a lot of us are looking at retirement so your job is just waiting for you, you know what they say "if you knock on a door that does not open it was not your door". It was hell for me to find my first nursing job. I did everything suggested in Nurse Beth's response. And more. started applying and networking from the very first day of nursing school. i even sent out resumes and spoke to the nurse managers at my clinical rotations (kindly, respectfully, non-aggressively). Paid a lot of money to have my resume professionally rewritten. went to every single clinical instructor I had and said "I would love to get hospital experience before I become an NP. Do you have any advice about how I can land a job?" several times I dressed up nice, office-casual and made my hair up into a perfectly coiffed bun. Applied some light makeup, put on my heel-scraping dress shoes and walked from hospital to hospital. Going into any med surg unit that would allow me access. I handed my resume to nurse managers with a warm smile and a handshake. One of them was and said she'd get back to me. One of them told me to come back in a week. When I returned exactly 7 days later, she blew up at me. Threw the resume in my face and yelled at me for being so arrogant as to come back and ask about job opportunities. I smiled warmly and said "if you know of any. You have my number." then I moved to Texas and got 4 job offers in a week. quit giving out stupid career advice and just cut to the chase: go where the jobs are. run.for.the.roses works as a RN. Concerto_in_C has 8 years experience and works as a Medical-surgical and telemetry nurse. Not every job opening is permanent. Some hospitals will require a nurse only for a few weeks. They are increasingly using temporary staff. I am temporary and I have 8 years of experience. I can do most types of nursing in my sleep, I'm cross trained on just about anything out there, all technologies, all electronic documentation systems. I can work on new floors after just 1 day of orientation. Given the choice between a new grad and an experienced temp, the hospital will choose a temp almost every time. I used to be a new grad, I know your pain, and to make matters worse I'm a guy and I have to deal with gender bias when I interview. Because I'm conscious of the gender bias, I don't interview well. It got to the point where I stopped interviewing and let my agency handle the interview. As a temp with strong resume, I get hired on the spot when they see my resume or by phone, but I don't go to interviews anymore. For new young people the market is brutal. Too high risk of litigation if the new grad makes a mistake or med error. I made a serious med error myself in 2008 when I was a new grad, a very serious error, so I understand the risk from the hospital's standpoint. Alex_RN has 3 years experience and works as a RN. I could have written this post. When I graduated, I had good grades, great references, a strong interview, a polished portfolio. It took me 6 months to find a job, and that job was not my dream job (LTAC, long commute, but I love my co-workers and patients). One mistake I think I made was that I only applied for hospital jobs. Had I applied for home health, flu clinics, anything, I would have then had a little healthcare experience to talk about during interviews. 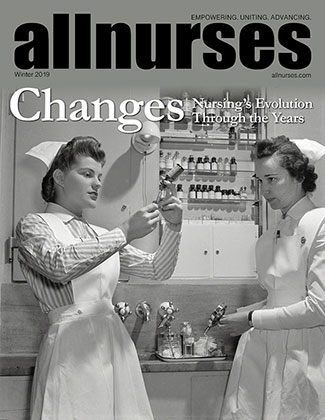 40% of nurses change jobs in their first year, probably because they are getting better jobs after they get their foot in the door. At my LTAC, I see new nurses like me moving on to regular hospitals after a year. That is my goal. In the meantime, I have developed kickass time management skills and gained really good experience. Also, if you are older, getting your first job will be a lot harder. Regardless, you WILL get a job eventually and you WILL build the career you want, just not as quickly as you had planned. Congrats on passing your boards. I agree with the other posters, have someone professionally review your resume and see if any alterations need to be done. I graduated in May many years ago and didn't get hired until November. I was so frustrated. I had to take a job at a LTC facility but it was a job and a source of income. I stayed there 5 years. You will find s position. Keep moving forward. Good luck.